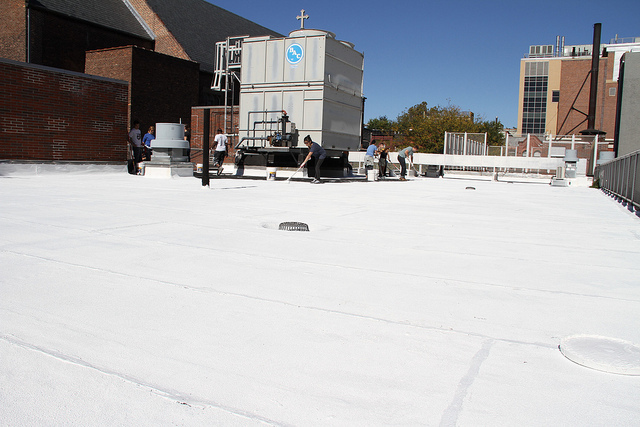 A study by Columbia University found that even the least expensive white roof coating can reduce peak rooftop temperatures in summer by an average of 43°F. Photo by 350.org. Even the least expensive white roof coating reduced peak rooftop temperatures in summer by an average of 43 degrees Fahrenheit, according to a new study by Columbia University on how different white roofing materials performed in New York City over multiple years. The “urban heat island” effect leads to a range of problems, from spikes in electricity usage and greenhouse gas emissions to poorer air quality and increased risk of death during heat waves. If white roofs were implemented on a wide scale, as the city plans to do, this reduction in temperatures could cut into the “urban heat island” effect that pumps up nighttime temperatures in the city by as much as 5 to 7 degrees Fahrenheit in the summer, the study explains. The white roof being tested was a low-cost covering promoted as part of Mayor Michael Bloomberg’s effort to reduce the city’s greenhouse gas emissions 30 percent by 2030. The Mineta Transportation Institute published a report on planning, designing and programming areas around California high-speed rail stations. The report presents 10 specific recommendations on how to achieve well-connected high-speed rail in California, such as considering the interface of four spatial zones: the station itself, the station-adjacent district, the municipality at large, and the larger region, which includes adjacent station cities. The report also suggests that planning for high-speed rail in low-density second-tier cities should take into account the immediate station area (within a half-mile radius,) the five-mile radius and the densest nodes or destinations within that wider region for jobs, services and commercial activity. A new study from the Tel Aviv University’s Department of Geography and the Human Environment discovered that low levels of carbon monoxide can have a narcotic effect that helps city-dwellers cope with other harmful environmental factors of an urban environment, such as high noise levels. This finding indicates that CO, in small doses, is a benefit to the well being of urbanites, better equipping them to deal with environmental stress. This is a surprising finding, especially since this tasteless, colorless and odorless gas is not only a danger to the environment but also highly toxic to human beings. Found in the exhaust of vehicles and generators, CO has been dubbed the “silent killer” because excessive inhalation is lethal, poisoning the nervous system and heart.